Zizyphus – Greek Myth or Curl Savior? And the preliminary results are in … Zizyphus may be a keeper! As many of you know, I ordered some zizyphus ($7.50 for 100g) a couple of weeks ago after Michelle of Radiant Brown Beauty did this post about her experience with it. When she contacted Mehandi.com to inquire about amla for curl restoration, they recommended this ayuverdic powder as a better alternative, with fewer incidents of irritation. In the past, I had used amla alone and mixed with henna in an effort to preserve my curls. However, my scalp was NOT having it and I discontinued using it. That is, I stopped until I decided to do a little experiment on my ends a few weeks ago, which I discussed here and here. As I kept the amla far from my scalp, I didn’t have any problems with irritation. However, I also couldn’t see much of a difference. After Michelle’s post, I was interested in seeing if zizyphus would perform better. Okay, first let’s discuss the mixing and application process. I mixed about 50g of the 100g bag in a plastic bowl with about a cup of filtered water to a yogurt consistency. Zizyphus is green and grassy smelling and was like melted marshmallow in texture when water was added. The water also increased the volume of the powder drastically. It really absorbed and swelled, almost “bubbling” as mixed (I probably could have used less than half of the bag). Now, this is where I had to make a decision. The online directions indicated that the mix should sit for 2 hours, whereas the directions taped to the bag implied the mix could be applied to hair immediately. Go figure! Anywho, I decided to go with the online instructions. So, I left the zizyphus to “marinate” while I ran to pick up a pair of fierce, peep-toe wedge booties that I had put on hold the prior day. After returning home, I got around to applying the zizyphus to my hair, which was saturated with a Vatika oil and EVOO pre-poo and was thoroughly detangled. I had done some research on the powder and one recurring complaint was that it resulted in extremely dry hair. I always read reviews that indicate this with a critical eye. It often seems to me that many with this complaint often do not regularly apply moisturizing deep conditioners after drying ayuverdic hair treatments. Because I wanted to pre-poo anyway, I thought the oils would provide a buffer for the potentially drying effects of the treatment as would a post treatment moisturizing DC. The mix was gushy and almost slime-like, but in that is was viscous and not muddy or drippy in texture. It kind of “glooped” as I squished it into my hair. 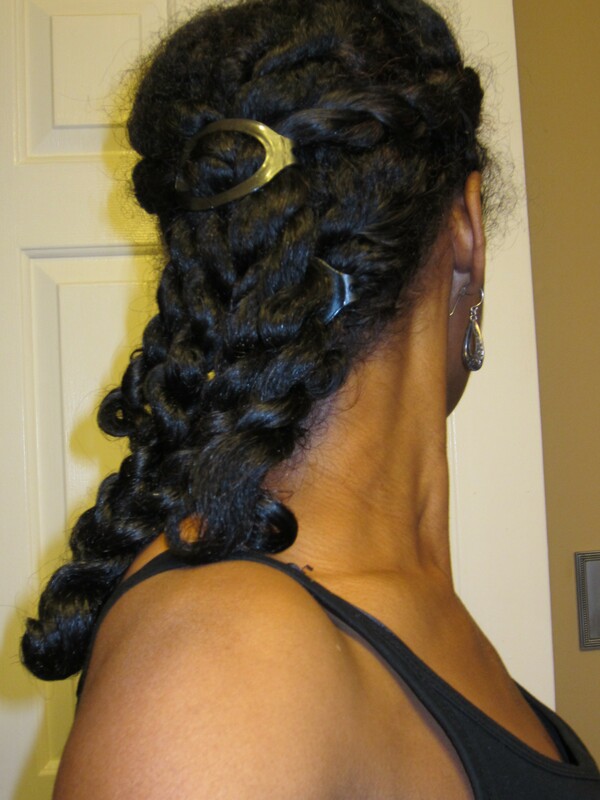 My hair was in six twists and I untwisted each section one by one, squished the zizyphus through, ensuring that my hair was thoroughly coated and then loosely re-twisted each section. I applied the zizyphus to the entire length of my hair except for the first 2 inches or so of roots. Then, I donned a plastic baggie and waited. About an hour or so later, I hit the bathroom to rinse the stuff out. Yeah … what the frick?!?! Michelle was NOT joking when she said this gook is a mother to get out of your hair. I have little to no problems rinsing henna. With this, I used hot water (as instructed) via the faucet in the bathtub. And I rinsed. And I rinsed. And I added some Aussie Moist and rinsed and rinsed some more. I will say this, as I rinsed the treatment, my hair felt very heavy and thick in a good way. It didn’t feel dry at all. After a while, I gave up on getting it all out and applied my DC as I had found this old blog post that indicated that the last of the treatment seemed to be removed by the conditioner. Michelle also indicated that she was able to work the residual mix from her hair when she applied a styling cream to do twists. So, after DCing for an hour, I rinsed using my normal technique, blotted dry, applied some DevaCare One Conditioner and twisted my hair into six twists. I could still see little flakes of the zizyphus all throughout my hair. But, it was past midnight and I was … put a fork in her … done. So, I hit the sack with my satin sock bonnet, twigs, grit and all. I wore the twists to work on Monday so that my hair could continue to dry, eyeing the flakes and hoping no one would be all up in my grill close enough to see them ;). I secured the twists with a couple of Goody Comfort Flex barrettes as pictured above. At lunch time, I applied some JBCO to the bottom couple of inches of the twists to seal (yeah, I carry a little repurposed container of JBCO in my purse … don’t judge! *lol*). I noticed then that my twists were very plump and springy. Hmmm, the prior night, I was thinking that zizyphus might be a wrap simply for the hassle it presented when rinsing. However, now that my hair was mostly dry, I was seeing some of the shrinkage that I have so desperately sought since henna began loosening my curls last year! And, the little flakes seemed to be easily dislodged with a few flicks of the finger. My hair also felt very soft, fluffy and moisturized (I will say that when I use DevaCare One instead of the Kimmaytube leave-in, I get a fluffier, more voluminous set … pH balance and all that jazz ;)). As I type this, my hair is still in twists and I suspect that I’ll just be pinning them up for work on Wednesday. I’ll take pics of the twist release later this week since, yup … you guessed it, I got my new camera!! Well that’s it for this loooooong, detailed review. What do you think? Do my twists look more plump and “shrinky” than normal? I think they do. The shine in these pics also seems ridic! But, I think that is just the new camera as I didn’t notice that much of a difference in the mirror;). Have you experienced a loss of curl due to henna, heat or something else and want your curls back? Have you ever tried Zizyphus? Would you try it? Would love to see what type of results others are having with this ayuverdic treatment! Okay, if you didn’t get my title for this post;) , if was referencing Sisyphus who was the king in Greek mythology who was condemned to perpetually push a massive rock up a mountain every day only for it to roll back down, forcing him to push it up again. thanks for being the guinea pig lol! When you said you would right a review,I went to the Mehandi site to check it out. The Jamila Henna has loosened my curls but I am ok with it because my hair is nappier than a sheep’s behind! I probably won’t use this cause The process(henna) enough w/o have to put in extra work to get it out of my hair. hey Tianna, you don’t really sound like you need to use the Zizyphus. You seem blessed enough to actually have a curl pattern! Me and I think I can speak for Shelli too, tend to get these dog gone straight hairs that don’t want to curl without a little help from the flexxi rods, so zizyphus is helpful for that. Yeahhh bouyyy didn’t I tell you?!!! Andy yes your twists ARE plumpier! I’m telling you I was shocked. I gotta get some more. I made the mistake of mixing the whole dang bag the first time but the good part is I refrigerated what I didn’t use for a week and it was still goodie-o. And yes, only on the ends because I think I would stress out tryiing to get the residual out from the roots. You know i was really LOL @ put a fork in her. I’ve been waiting for this post to see if it worked for you too. Yippee it does and I’m glad. Now, we have to experiment on how to make it so it rinses out better. I think I’m going to experiment with adding some honey. by the way, did you see my review of Jamaican Black Castor Oil Protein Conditioner??? Girl, that’s another keeper for me. It also restores the pH balance and creates springy strong hair. I took out my braids today to put them in a bun and NO breakage at all! I usually have some when taking the braids down but my ends feel fabulous and strong. I even took a shed hair to stretch it and test it’s resilience. Friggin’ amazing! The hair was so strong and very difficult to pop. side note: I wanted to try the Aussie Moist conditioner but went to the store and that bad boy was $5 for a small ball. Gotta hit up another store..
Don’t you just love it when you find things that work for your hair? I’m so tired of trying new things sometimes I just want to settle on what works. Michelle, so refrigerating it worked? I googled that as I don’t think that I necessarily needed the whole 50g either! But, I applied it all as I couldn’t find anything about storing it. Okay, now to the rinsing thing. Look at this pic!!!! 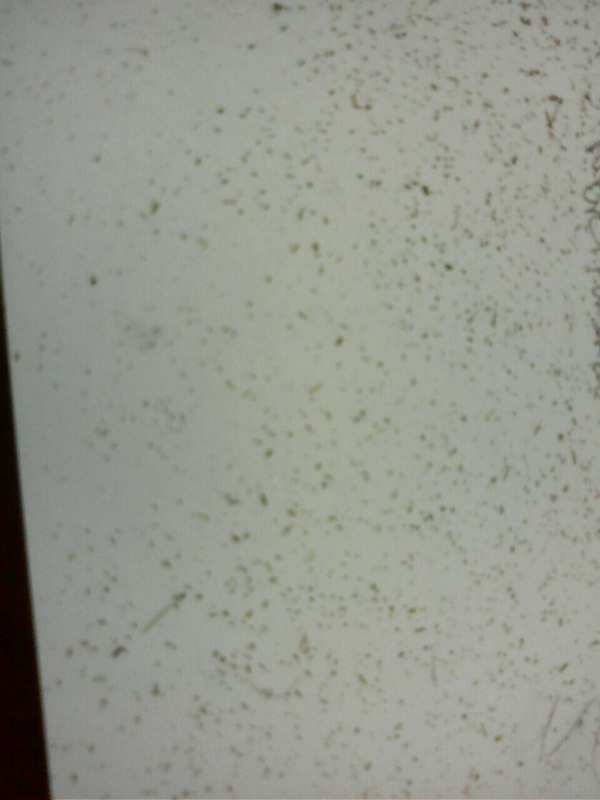 These are some of the Z-flakes that I was shaking out of my twists today!! What the frick?!?! I mean, they shook out easily, but dang!! I need to do the head dunk first next time!! This junk really sticks!! I did see your post about the JBCO Protein DC. My hair isn’t too fond of many proteins and mayo/egg conditioners never did much for my hair. So, I may leave that one to you, but it’s awesome that your breakage stopped!!! Congrats!! As to the Aussie Moist, WHAT?!?! I spend $5 on the massive, like, 40 oz. bottle from Walmart! Yeah, they were trying to gank you!! Miche’al, yes I do. Now, if only I could get it all out of my hair though!! LOL!! You know, since your hair isn’t breaking the protein condish isn’t even necessary. i plan to use this every other wash so I don’t protein-OD. The weeks in between I’ll use the SM hair masque with the honey as suggested. Going to try it tomorrow night since I didn’t pre-poo last night and like to sleep in it. i’m on a hunt for AM. I refuse to pay that much. ShopRite usually has condish on sale once a week. I got a giant bottle of HE for $2.99!!!!! you know i bought 2 bottles. Wish I had bought more now. 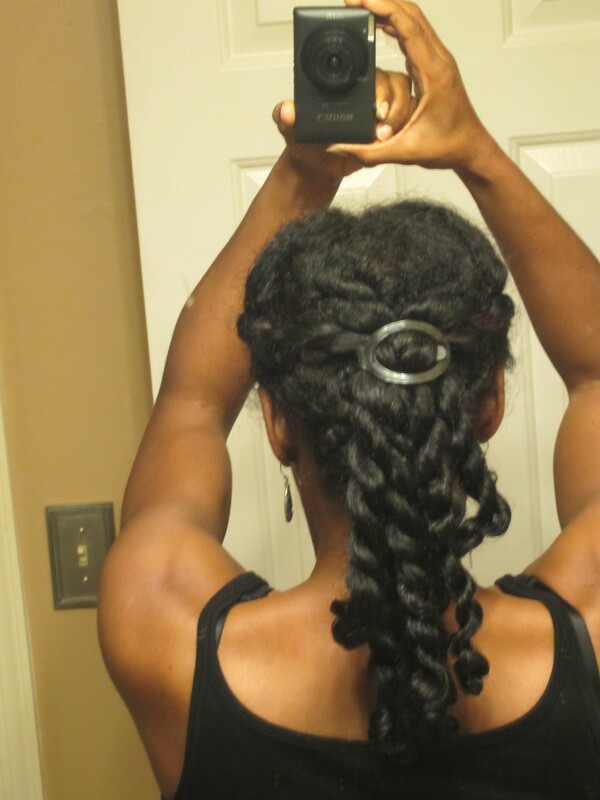 Your twists ARE looking plump Shelli!!! Really?!?! Okay, I’m psyched that it wasn’t just in my head:)! LOL! Love it Michelle! You were right! My curls were poppin’. Like Shelli experienced, it was a mother to get out. But heck it was worth it! I’m going to do it again this weekend! @Shelli can you please tell me which Deva Curl do you use? I have see the word “one” on a couple of bottles. Is it the orange looking one. That’s where you’re getting mixed up Miche’al. There is DevaCURL One and DevaCARE One. I use DevaCARE, which is the color protect Deva line. Yes, it has more of a beigey/orange color whereas DevaCurl is white. Rece had a problem with the orange extract in the DevaCare line. So, if you have a sensitive scalp/hairline and use the DevaCare, watch how your skin reacts to make certain you don’t have any issues.